Our law enforcement cars perform impeccably when the chips are down. 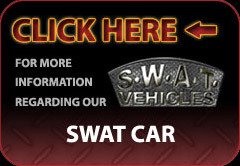 Our armored law enforcement cars offer an unrivaled level of protection. There is a reason that law enforcement organizations nationwide and even internationally depend on The Armored Group for their armored law enforcement vehicles. Our armored cars featured advanced design and superior engineering, and are customized to meet the exacting needs of our clients. From SWAT cars and emergency deployment vehicles to BATT vehicles and more, we consistently create the types of armored cars that cops, sheriff departments, highway patrolmen and more count on to rise to the occasion. The men and women who devote their lives to law enforcement deserve the ultimate protection when it comes to the vehicles they use. We are here to offer that protection with custom vehicles designed to keep them safe as they carry out their all-important work. We are eager to work with your organization, and look forward to creating custom tactical vehicles on your behalf. The threats law enforcement officials face on a day-to-day basis are very real. The Armored Group salutes these brave men and women for the work they do to protect the rest of us, and is proud to do our part in making sure they are safe when the chips are down. You may reach The Armored Group today at (602) 840-2271. We look forward to discussing your specific needs when it comes to armored cars, and to showing you why we are the right choice for your organization. Our relationship with law enforcement is important to us, and we look forward to serving you.